Pamplin Media Group - Will Portland-area freeways be tolled? Will Portland-area freeways be tolled? Many questions remain about the proposal to toll parts of I-5 and I-205 in the Portland area that the Oregon Transportation Commission will consider submitting the Federal Highway Administration at its Dec. 6 meeting. They include when the tolls would start, how much they would cost, how much they will increase during heavy travel times, how lower-income drivers will be subsidized, and if drivers can be prevented from diverting on to neighborhood streets to avoid them. "Tolls are a new idea in Oregon and we know there are a lot of concerns, and we're committed to conducting more outreach and listening to people," OTC Commissioner Alando Simpson said during a press briefing on the draft application last Friday. The potential tolls are intended to reduce congestion and raise funds for freeway-related construction projects. The OTC was directed to apply to the FHWA for permission to impose them by the 2017 Oregon Legislature, which said traffic congestion in the Portland area is a statewide problem. "Congestion is causing problems with the quality of life in the region and the economy of the state," OTC Chair Tammy Baney said during the briefing on the draft application. The Legislature directed it to be submitted by the end of this year. The idea is controversial and has generated both support and opposition. Backers say it will increase the reliablity of trips and reduce greenhouse gas emissions. Opponents argue the freeways are already paid for, although the gas tax which has historically funded maintenance is not keeping up with demands. An initiative petition is currently in the works to place a measure of a statewide ballot to require all toll funds to only be spent to increase road capacity. The OTC meeting will begin at 9 a.m. Thursday, Dec. 6, at the Gail Achterman Commission Room in the Oregon Department of Transportation headquarters, 355 Capitol St. N.E. in Salem. 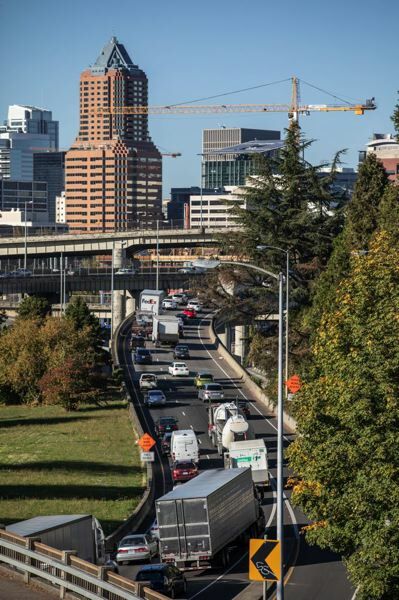 According to the Oregon Department of Transportation, drivers in the Portland metro area experienced nearly a 14 percent increase in hours of congestion between 2013 and 2015. As congestion grew, travel delays increased almost 23 percent in the same time period, and crashes also increased. The congestion impacts the state economy through delayed movement of goods and services, and compromises reliability and certainty for employers and employees. After passage of the Keep Oregon Moving Act in 2017, the OTC developed the application with the assistance of a regionally representative 24-member bi-state Policy Advisory Committee. It was co-chaired by Simpson and OTC Commissioner Sean O'Hallarent. The PAC forwarded its recommendation to the OTC for variable rate tolling on I-5 and I205 in July 2018, after seven months of analysis, six committee meetings, and extensive public engagement, including polling. The OTC hopes the FHWA will says whether the tolling proposal is moving in the right direction within a few months of the application being submitted. Even if the FHWA approves them, the tolls cannot be imposed for several years, at the earliest, however. "We don't want people to think they're going to wake up tomorrow and have to pay to drive the freeways," said Baney. If the tolling proposal is supported by the FHWA, project refinement, environmental review, funding and construction of the tolling infrastructure would follow over the next several years. The analysis will focus on concerns that were raised frequently during the feasibility phase of the project, including reducing the potential costs on lower-income drivers, needed improvements to mass transit services and other travel options, and minimizing diversion impacts to neighborhood streets. Congestion pricing is typically implemented with transit improvements to provide more travel choices. The OTC recently directed ODOT to develop an approach to studying tolling on other Portland area highways. A proposed scope of study will be presented to the OTC in early 2019. The 2017 legislation established a Congestion Relief Fund within the State Highway Fund, which would receive any net proceeds from tolling. Accordng to ODOT, under the Oregon Constitution, the State Highway Fund must be spent on roadway projects, which could include travel lanes, bicycle and pedestrian facilities, or transit improvements such as enhanced transit stops. Revenue from tolling would be used for adding new lanes on I-5 and I-205 and other highway improvements. reconstructing or replacing a bridge, tolling a new lane, or converting a carpool (high occupancy vehicle) lane to a high occupancy toll lane. The OTC may seek authority to toll under the federal Value Pricing Pilot Program, which allows FHWA to waive some restrictions on tolling, or federal law under Title 23 Section 129, which allows tolling when associated with some infrastructure improvements. The 48-page draft application can be found here.